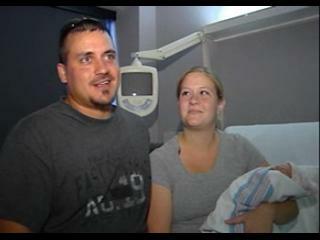 Home » Ohio Baby Born on 8/9/10 at 11:12pm! When Terri Riehle arrived at the Christ Hospital to be induced on Tuesday she knew it was going to be a special day. When her Doctor, Peggy Heis, noticed that date 8/9/10, Terri just figured it would make it easy for her to not get her kids birthday’s mixed up. “And then just joking I said wouldn’t that be fun if happened at 11:12,” says Dr. Heis. But 11:12 in the morning came and went. “Everybody was making bets and guesses on when she was going to come out,” says Terri. 12-hours later, just before 11 p.m. that night, the labor really started getting intense. “I looked up and it was a quarter till 11 and I said to mom, ‘Do you want to wait?,'” Heis says. “And I’m like no, lets just get this over with NOW!” says Riehle. But the minutes passed and despite Terri pushing, the baby was taking her time. “I looked at my mother-in-law right as the baby was coming out and I looked up at the clock and I tapped her and I started pointing at the clock like look look, ” said the new dad Scott. Sure enough, her baby made her big debut right on time. 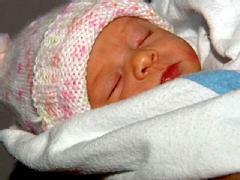 Ella Rose, born 8/9, 2010 at 11:12, weighing 6 pounds, 9 ounces. This will be a day that the Riehle family will cherish forever and the scrap book that they can make from the news coverage will just make it that much more special!